A beautiful original track and four talented remixers with their own highly individual takes make this an incredibly exciting release. 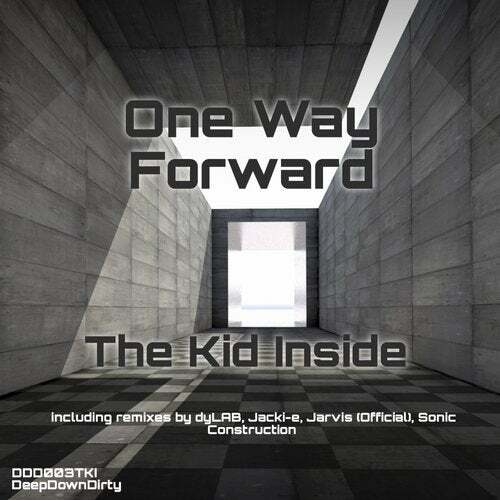 Uplifting, emotional synths, gorgeous melodies and layered soundscapes coupled with an infectious beat make the Kid Inside's original mix of 'One Way Forward' a real aural treat. dyLAB provides an acid treatment, retaining the synth rhythms that create so much of the beauty in the original mix, with that distinctive acid bass line perfectly complementing the original parts to create a brand new dynamic. Jacki-e ups the tempo, adding vocal parts and new synths to give a different dimension and emotion to her remix. Jarvis keeps us dancing with a new acid bass line providing an effective counterpoint to the melodic elements of the original and some beautiful chords added to the breakdown. Sonic Construction's remix uses original melodic elements as repeated, rhythmic phrases and re-weaves them into a more chilled, reflective vibe. Five great tracks, four brilliant remixes and three simple words means there's only One Way Forward! Many thanks to Jacki-e of A Darker Wave and Draw The Line Radio Show for also providing the release description for this release.